Which machine and accessories for which application? The RSEV 19-125 RT renovation grinder has a powerful 1,900 watt motor and huge torque, ideal for grinding off old coatings, and it can work close to edges meaning no more time-consuming reworking. (220-240 V / 50 - 60 Hz); Plastic Carry Case; with Diamond Cup Wheel Concrete "professional"
(220-240 V / 50 - 60 Hz); Plastic Carry Case; Diamond Cup Wheel Abrasive "professional"
Plastic Carry Case; with Diamond Cup Wheel Concrete "professional"
Plastic Carry Case; with diamond cup wheel abrasive "professional"
Plastic Carry Case; with PCD cup wheel "professional"
In the past users often used a chisel hammer or angle grinder for the removal of concrete, plaster or screed - a tiring and dusty undertaking. 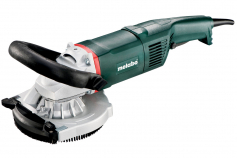 The robust and powerful renovation grinders from Metabo help you to carry out your work faster, more efficiently and with effective extraction. For sanding old layers and coatings at walls, ceilings and floors, we offer you with two machines, effective extraction solutions and matching cup wheels a powerful system: The RS 17-125 renovation grinder is extremely capable to handle overloads and designed especially for hard jobs on the construction site. By virtue of its powerful Metabo Marathon motor with 1,700 watt rated input power, it endures hours of continuous use without getting hot. This permits to you reliably sand large areas. 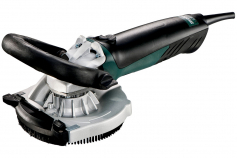 With the RS 14-125 we offer plasterers, floorers, painters and persons effecting complete restorations an extremely compact and ergonomic sander, which is particularly suited for use on small areas or even for delicate materials. Its no-load speed can be set infinitely and can be optimally adjusted to the material to be processed. Both grinders have a spring-mounted brush rim that adapts to the material surface and thus permits optimal dust extraction. The aluminium die-cast guard makes the machines particularly robust and offers a practical extra: Their front part can be folded upwards, without having to remove it and thus risk losing it. With the guard folded up you can sand right up to the edge of a wall, ceiling or floor. This saves tedious manual reworking. 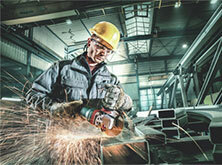 The ergonomically shaped, tool-free adjustable bar handles help to guide the grinder in a safe and uniform manner. 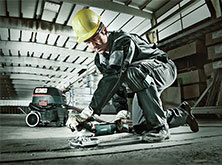 Metabo offers a wide range of accessories for both grinders that is adapted to the different applications. This includes for example different diamond cup wheels and a special PCD cup wheel for the removal of thermoplastic materials. With the renovation grinders and different cup wheels you can, for example, remove coatings, hard cement plaster, concrete, adhesive remains and much more in a clean and fast manner. 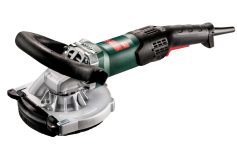 Vacuum cleaners, like the ASR 35 M ACP, which can optimally handle even large amounts of dust, can be connected to both hand-held renovation grinders and deliver particularly clean finishes.